An adventure to the Canadian Rockies will not disappoint. Renowned as one of the most beautiful places in the world, the landscape is dotted with astounding lakes and rigid mountain faces. Before planning your trip to this magical land take a look at the below tips and hotspots. 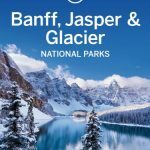 Banff is often the starting point for a backpacking, hotel hopping, or camping trip. There is a ton of stuff to do here: nightlife, amazing restaurants, hikes, rafting, and much more. Nightlife: There are a handful of bars and even clubs in this tourist town with plenty of great beers to choose from. Canada is well known for their breweries and vast selections. Food: The food is great too but hit and miss. Two pubs side by side may look the same but the quality of food can be night and day. The Rose and Crown off the main street is an absolute winner! For those meat eaters out there try the Elk Stew. It’s phenomenal. Hikes & Outdoors: Hike to the top of Sulfur Mountain for stunning 360 views of the Rockies. You can also take the Gondola ride for an easier route but either way at 7,500 feet you won’t regret the pictures you get at the top. Bow Falls is also an easy and quick hike to check out. More of a flat walk than a hike, this large section of the falls is like a baby version of Niagara (a real baby version). The ride from Banff to Jasper is an absolute must while exploring the Canadian Rockies. 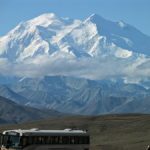 The area is known for its mountains, glaciers, avalanches, and lakes. Not far from Banff is the Lake Louise area. This is just one of many mind boggling lakes. The colors look like something out of a cartoon. Bright turquoise, greens, & blues. Check out the beautiful Fairmont hotel overlooking the lake but be sure to hike the Plain of 6 Glaciers. This 6 mile moderate rated hike is not easy, but not too hard either. It’s well worth it as you walk along the lake and up into a vast valley of glaciers. The highest point gives you a great view of the valley with glaciers behind you and the lake down below. 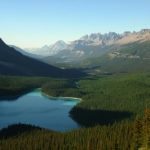 From Lake Louise toward Jasper there are hundreds of hikes and gorgeous lakes to see. It’s impossible to do it all. There are a variety of short stops for lake viewpoints and mountain range landscapes along the way. The colors of each lake are so unique they never get old! Be sure to set time aside to see the Columbia Ice fields. Only 1 hour from Jasper, the base of this massive glacier is an easy 5 minute hike. Home to the Athabasca Glacier, you can also take an ice cat tour onto the ice fields themselves. 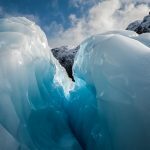 This glacier trek is reasonably priced and well worth it. Be sure to do it on a sunny day since the deep glacier blues shine best in these conditions. Jasper is a much smaller tourist town compared to Banff but its quaint feel, bars, shopping, and large variety of restaurants may appeal more to some. Backpackers will feel more at home here. The best hikes are in this area and plenty of remote places to settle down and camp for the night. The Astoria hotel toward the end of town is a great place to catch some zzz’s when on a budget. There are also plenty of camp sites and a few great 4-5 star hotels as well. 1. Maligne Canyon Hike: A very easy hike suitable for all abilities. The trail takes you along a vast canyon and cave system. In the summer the water rushes through at intense speeds and in the winter it becomes snowed and iced over. The best time to do this hike is definitely in the middle of summer. 2. Maligne Lake: Beyond the canyon hike, about a 30 minute drive, is Maligne Lake. This famous lake has a darker greenish color compared to others and is a great place for a picnic. You can also hike around and take a boat tour to the island in the middle. 3. 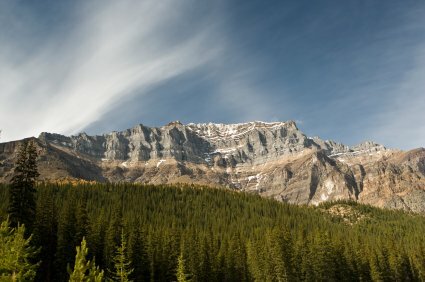 Cavelle Meadows: The best hike in the Canadian Rockies! This is certainly not a hike for beginners but it is still rated moderate at 5-6 miles with varying degrees of difficulty. The first leg starts with a breathtaking glacier melt with icebergs floating in a glacier fed pool. The entire hike showcases an unbelievable avalanche display. It is like watching large waterfalls of snow poor off 7,000 foot drops. Loud cracks and booms pop off the cliffs by the minute as new avalanches begin. The top is about 1,000 feet above the tree line with a bare landscape of mountain grass, bushes and fantastic views. Do not miss this hike. It is a great experience.